Barnet, United Kingdom: The Stellar Press, 1961. Book. Near Fine. Soft cover. 1st Edition. Original pink printed wrappers, titles to front cover black. Light dustiness and some faint marks to wrappers. 6 tipped-in autolithographs by Charles Mozley printed in sepia with occasional heightening in violet, quotation from Ulysses to each facing verso. First edition, signed limited to 165 copies, this being #69. 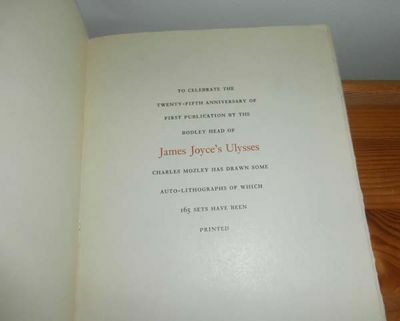 Printed for private circulation to commemorate the 25th anniversary of the first publication of Ulysses by the Bodley Head..